#NoMakeUp: Say “Hello” to a whole new Adele! The vocal powerhouse showed off a rare makeup-free look while enjoying some recent downtime during her global tour. In a series of bare-faced Instagram photos, Adele ditched her signature cat eye for a more casual off-stage look. One black-and-white snap shared on Monday pictures the “25” singer taking a relaxing dip in Denver and laughing with a pal. A more poignant-looking pic from Wednesday shows her looking thoughtful before her Vancouver concert, as a glass of wine and her cherished pup sit nearby. Soon after, Adele gave fans a more up-close peek at her fresh complexion with a backstage candid taken at the Canadian city’s Rogers Arena, as she jokingly points to the Canucks security logo on her button-down shirt. The top-selling artist hasn’t left her glam routine behind completely, however. 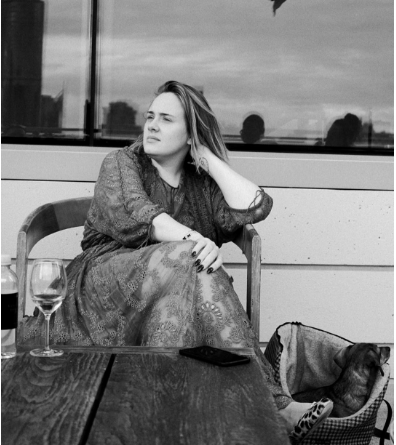 According to her most recent social media posts, Adele’s bold, almond-shaped manicure remains on full display. After a second Vancouver show on Thursday night, the Grammy winner hits the road again for a two-day stop in Seattle.